Governor Andrew M. Cuomo today announced Brine Wells Development LLC has been chosen as the developer for the restoration of the historic Hotel Niagara in downtown Niagara Falls, New York. The Hotel Niagara is the oldest standing hotel in Niagara Falls and retains much of the architectural integrity that once made it an iconic piece of the city's skyline. The approximately $42 million project will utilize historic preservation tax credits to transform the property into a full-service, 130-room upscale hotel with restaurants, lounges and banquet facilities. The USA Niagara Development Corporation, a subsidiary of Empire State Development, officially selected Brine Wells Development at its Board of Directors meeting this morning. The property is expected to re-open in spring 2019. Renderings are available here. "Our strategic investments, from parks to infrastructure to the hotel and hospitality industry, are reinvigorating tourism in Niagara Falls, and the return of the Hotel Niagara is the crown jewel of this revival," Governor Cuomo said. "Across the state, we are driving regional economic growth by investing in the unique strengths of each community, and today we continue to move Western New York forward." The Governor also announced that the USA Niagara Development Corporation board approved costs for a tourist-oriented traffic study, conducted in response to concerns expressed from local businesses and residents about periodic traffic backups occurring in areas surrounding the State Park and along the Niagara Scenic Parkway during peak summer visitation times. The State Highway and Bridge Trust Fund Project Agreement with USAN and the New York State Department of Transportation will make funds available to cover the costs of a study to develop best practices to address transportation access and parking demand needs for the unique setting of the tourism district in downtown Niagara Falls associated with Niagara Falls State Park and other local resources/attractions. Lieutenant Governor Kathy Hochul said, "The restoration of the historic Hotel Niagara is another milestone in the economic rebirth of Niagara Falls and Western New York. Since 1924 its unique architecture has defined the city's skyline, and it has been a home away from home for movie stars and US presidents. With this project, it will also become a symbol of the transformation taking place thanks to the Buffalo Billion and Governor Cuomo's commitment to creating jobs and ensuring that this region remains a world-class tourism destination." Howard Zemsky, President, CEO & Commissioner of Empire State Development, said, "Today, more people than ever before are coming from around the world to visit Niagara Falls. Our goal is to optimize the tourist experience and help visitors easily enjoy a variety of activities when they are here. Niagara Falls State Park, city residents and local business will all benefit from a more efficient flow of traffic around the New York State's most popular tourist attraction." Department of Transportation Commissioner Matthew J. Driscoll said, "As the State Department of Transportation has long held, a strong transportation network that includes efficient transit options can boost local economies in many ways, so it's important to look at how best to invest in transit in a way that supports and grows the booming tourism economy of Niagara Falls. With this team assembled by Governor Cuomo, we will study the most efficient ways of moving people around the city to improve safety, traffic flow and access for all users." New York State Parks Regional Director Mark Thomas said, "The revitalization of the city of Niagara Falls and Niagara Falls State Park are bringing more and more visitors to witness the grandeur of one of the world's greatest wonders. We look forward to further improving the full experience for all who visit and reside in this special place." Senator Rob Ortt said, "Hotel Niagara has been vacant for far too long, and it's encouraging to see plans moving forward." Chairman of the Niagara County Legislature Wm. Keith McNall said, "We're gratified that New York State is investing in the rebirth of a treasured landmark in Niagara Falls and expansion of our tourism and conference industries, and also that our state leaders have the foresight to invest in traffic mitigation as part of that project. The Hotel Niagara holds a special place in this region's history, and it is an iconic part of that city's skyline, and our county's storyline." Niagara Falls Mayor Paul Dyster said, "First and foremost, I want to congratulate Ed Riley and his team for submitting this proposal to redevelop one of the most iconic buildings in Niagara Falls. Their work on historic renovation projects make them the ideal team to bring the Hotel Niagara back to life. This building was underdeveloped for too long, and under the leadership of Governor Cuomo and his team at Empire State Development that will no longer be the case. Thank you Governor for your commitment to Niagara Falls and Western New York." Brine Wells Development LLC, Managing Member Ed Riley, said, "Brine Wells and all of our team look forward to making the Hotel Niagara the historic hotel for Niagara Falls and is excited for the opportunity afforded by Governor Cuomo." USAN President Christopher J. Schoepflin said, "It is Hotel Niagara's amazing story, architecture, and connection to our community that makes its redevelopment effort so important as we work to ensure the Niagara rightfully plays an important part in Niagara Falls' future. USAN will work closely with Brine Wells to restore this historic property and put it back to productive economic use while contributing to the visitor and resident experience here in Niagara Falls." John Percy, President & CEO of Destination Niagara USA said, "As our destination continues to develop, we are also faced with the growing pains of heavy traffic and congestion throughout the downtown corridor. I applaud Empire State Development for recognizing the need to determine what the future consists of as it relates to traffic access in order to ensure that the visitor experience continues to remain positive." "Our strategic investments, from parks to infrastructure to the hotel and hospitality industry, are reinvigorating tourism in Niagara Falls, and the return of the Hotel Niagara is the crown jewel of this revival." The Hotel Niagara property was acquired by USA Niagara in July 2016 with Buffalo Billion funds to facilitate its restoration and reuse. 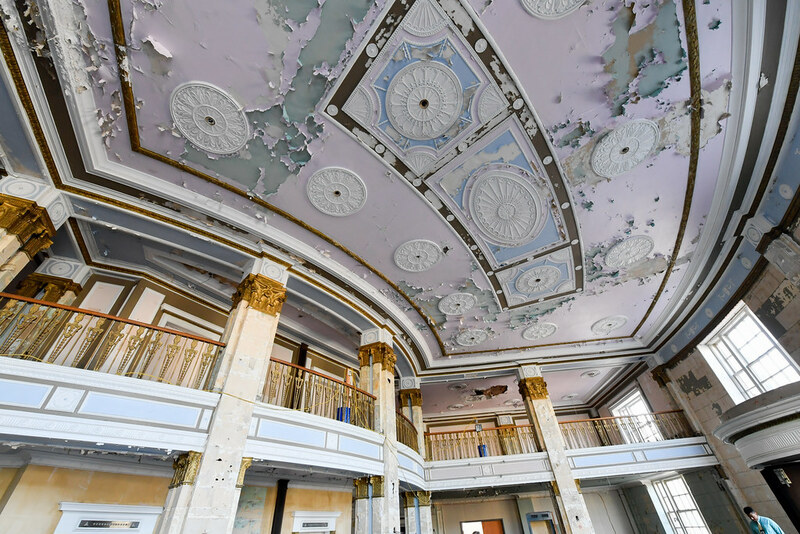 Brine Wells Development's plans will restore the lobby and related spaces to a quality level consistent with the original design and restore the main ballroom to its original 1920s condition. An on-site full service restaurant will focus on local foods and New York State wines, to be complimented by a "speak easy" style lounge opening onto the sidewalk. Other amenities include private meeting and dining rooms, a gift shop and exercise facilities. A new roof top terrace lounge is also being proposed, with Brine Wells Development working alongside the New York State Historic Preservation Office and the National Park Service to ensure that the historic integrity of the building is maintained. The Hotel Niagara project, the first historic restoration of a hotel in the City of Niagara Falls, will restore the building's finishings, details and design elements to the original intent and offer its guests high quality service. Built in 1924, the 12-story Hotel Niagara was among the city's finest lodging and banquet establishments, and it is now listed on the National Register of Historic Places. Although it has long held a prominent spot in the downtown Niagara Falls skyline, decades of deferred maintenance, neglect and multiple changes in ownership resulted in the property's degradation and eventual vacancy. The Hotel Niagara's final iteration, a Travelodge, closed in 2007. The proposal includes the sale of the Hotel Niagara property to Brine Wells for one dollar, and the company will then invest approximately $42 million into transforming the site. To support the project and ensure it moves forward, the developer is expected to seek a grant of up to $3.5 million, subject to approval by the USA Niagara Board of Directors. The project will also utilize historic tax credits. Federal historic tax credits allow for a credit equal to 20 percent of the total dollar amount of eligible capital expenditures for the rehabilitation of historic, income-producing buildings that are determined by the U.S. Secretary of the Interior, through the National Park Service, to be 'certified historic structures'. At the State level, a similar 20 percent credit is available, but is capped at $5 million when federal credits are also applied. Brine Wells Development previously completed a similar transformation of the 92-year-old Hotel Syracuse in Syracuse, New York. The estimated $75 million Marriott Syracuse is a complete redevelopment of the historic Hotel Syracuse into a full service four-diamond facility with 261 guestrooms, two historic ballrooms, an IACC certified conference space, six food and beverage venues and a completely restored lobby. The property opened in August 2016. With the significant increases in daily visitation to Niagara Falls over the last decade, along with the sharp growth in overnight stays triggered through multiple new downtown development projects coming on line, local officials have come to see the need for a more proactive policies and efforts to facilitate tourist access. In response, the tourist-oriented transportation study be aimed at evaluating transportation management issues, including tourist-season multi-modal access and parking demand needs for the unique setting of downtown Niagara Falls and surrounding neighborhoods associated with Niagara Falls State Park and other local resources and attractions. The study, coordinated with the City, Office of Parks Recreation and Historic Preservation, Department of Transportation and other stakeholder agencies/groups, and will develop cost estimates for a number of proposed improvements, as well as phasing plan to optimally implement such improvements in the field. Through its State Dedicated Highway and Bridge Trust Fund, NYSDOT has agreed to provide USAN a $300,000 grant to fund the study. These funds will reimburse USAN for its direct consultant expenses in advancing the study. The total project cost for USAN will not exceed the $300,000 grant. USAN, a subsidiary of Empire State Development Corporation, is solely dedicated to the support and promotion of economic development initiatives in Niagara Falls by leveraging private investment and encouraging growth and renewal of the tourism industry in the City of Niagara Falls. For more information, visitwww.usaniagara.com . Brine Wells was formed in early 2015 with a focus on project management, hospitality real estate development and asset management. Brine Wells has a core group of partners and principal associates who have vast experience in the industry and seek opportunities to collaborate with other companies to create notable success. Due to its design backgrounds, it provides a unique perspective to a project or development. Prior to the founding of Brine Wells, its partners and key associates have completed over $2.5 billion of renovation or development projects within the hospitality industry. For more information, visithttp://www.bwllc.com/.